It’s not that I don’t love them all. I do – madly. But there are a lot of them. 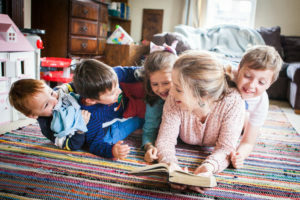 Maybe they seem more numerous because all of them are so very small – of course lots of people cope admirably with 5+ kids, so why should I be complaining at having merely four to raise? The fact that, laid end-to-end, they would barely reach the length of our living room perhaps gives the feeling that they are more than their sum. Maybe it also has something to do with both me and the hubster being raised in smaller families. Whilst I have two siblings, the age gap is so great that I was effectively raised as an only child – and hubby has just the one sibling. Nowadays, when he’s asked how it’s all going with our newly-expanded family, this man who, in another life, would have been perfectly happy as a childless batchelor replies dryly, “Yep, it’s going great. I think we’ve both got used to having too many children”. We were at a party the other week and, at any one time, I only knew where maximum 3 of my kids were. I’m not lying. Because when our sociable, food-loving kids are in an environment where there are lots of people and scones, how is it even possible to keep track?If God had meant families to have more children than parents, then He could at least have designed us with more eyes and arms. The other day, someone asked me how it was going, and I was explaining that it was generally OK, but pretty non-stop from 7am-11pm. “Oh yeah,” he said, “because I guess in the evenings you have the next day to prepare for.” Honestly? I would love to live in the sort of world where I could afford an evening’s preparation for the next day. I can see it perfectly: there’s me, peacefully ironing school uniform while the last of the evening sun glimmers in through the window and Radio 4 murmurs in the background. Then I’m putting together nutritiously balanced packed-lunches, and making a mental note that we’re running out of quinoa. Finally I’m Pinteresting messy play ideas for toddlers, finding one my boys will love, and gathering together everything needed from my well-stocked and well-ordered craft cupboard. And then, of course, it’s bed by 10, so that I can be well-refreshed for the day. Yep, right. This is a reality that will, sadly, never be mine. Evenings are spent clearing up the day’s detritus. Scraping hardened Weetabix off the dining floor with my fingernails. Emptying the overflowing nappy bin into the washing machine. Retrieving my stilettos from Missy’s bedroom. Friends are like, “How do you cope?” and I’m all “But no, you don’t get it, I really don’t.” Our house is an excellent advert for contraception. There is Stuff everywhere, including in the toilet. Laundry bins are rarely emptied. (And, when they are, you can bet your last pound that this momentous achievement will be followed by a bed-wetting event. The other time bed-wetting occurs is the night after you’ve changed the bed linen.) Mealtimes feel like a military procedure – in a regiment where your soldiers need to be asked a question 17 times in order to respond: Do you want ketchup or mayo? Ketchup or mayo? KETCHUP OR MAYO OR BOTH???? I assure you, it’s only by the grace of God that we all end up in our own beds under the same roof each night. Ignorance. Pick any minute of any day, and there are usually three kids being ignored. I call it character-building. By the age of 7, each of them will be able to prepare their own snacks, dress their own wounds and reach their own footballs down from the garage roof. 21st-century kids are far too molly-coddled. Lower standards. Facebook pictures of my friends’ newborn babies, sleeping sweetly in the cutest outfit, with a beautiful hand-knitted blanket, and just the right filter to make the picture canvas-worthy – this, my friend, is not a world that I inhabit. The older two dress themselves – they have to – which inevitably means Mister ends up in a blue T-shirt and muddy blue tracksuit bottoms, despite having patiently and repeatedly given him the fashion advice that blue and blue do not go together, and asked him kindly every night since he was 5 to please put your dirty clothes in the laundry bin – and Missy ends up wearing trousers, a skirt and a dress, topped off with a tiara, sunglasses and wellies. The younger two get dressed by me or Desert Dad – but, since we are both so dog-tired, our ability to put an outfit together which is a) clean, b) hole-free, and c) well-fitting is, quite frankly, non-existent. So, despite my general hatred of hashtags, #toomanychildren is one which is here to stay. The noise, the mess, the anecdotes that we will share over dinner parties when we are old and grey, the memories we’re apparently making, the sleep deficit we’re building up – it’s here to stay. And, it pains this organisational-freak to say it, but I actually love it. I’m impressed that it took you 4 children before you came to this state of ambivalent acceptance? We reached that point after our first!!! At the end of the day, as long as the kids are fed, clothed, loved and happy, the magazine-perfect homes can stay exactly there – in magazines!